Cookie cutter is not a term you’ll hear in conversations describing Lofty Mountain Grandeur chalets. 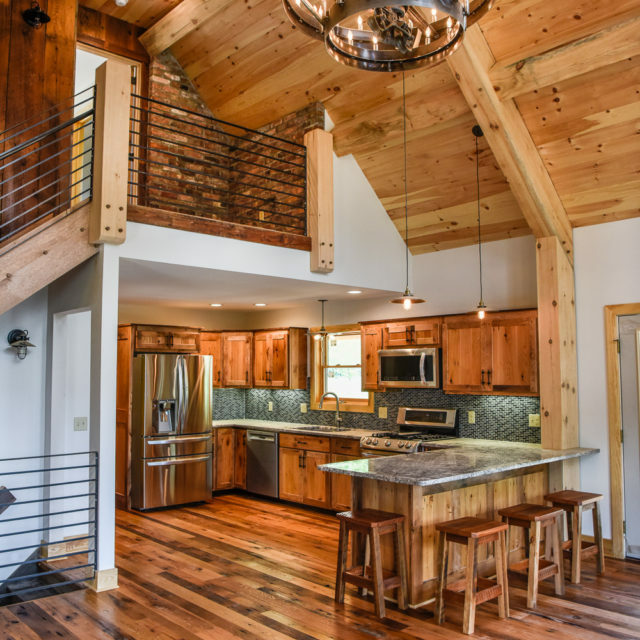 These award-winning custom timber frame chalets, located in East Otto, New York — just minutes from Ellicottville — are carved within nature’s beautiful mountain landscape and provide the perfect escape from the hustle and bustle of everyday life. Incorvaia and his business partner, Donald Matre, purchased 200 acres, parceling them into 31 five-plus acre wooded lots with deeded rights to numerous nature trails and fishing ponds. Dana John Contracting constructed eleven 2,300 and 3,000-square-foot, three-level chalets as part of Phase I, all of which have sold. Five homes have been constructed so far as part of phase II. What sets Lofty Mountain chalets apart? It’s the many extras — which, are in fact, standard – that create a rustic, elegant, yet comfortable, charm you can’t wait to come home to. Incorvaia has a passion for finding unique and interesting materials and repurposing them when building his chalets. “People call me when a barn or building is being torn down. They know I will make good use of the materials, they won’t be destroyed or land filled,” says Incorvaia, who enlists local experts to dismantle, inspect and treat materials he purchases and hires local craftsmen to do much of the work by hand. Bricks used to create visually appealing interior walls might have come from a demolished building near Buffalo’s Broadway Market. Many exterior and interior walls are constructed from 8’by 8’ locally sourced Civil War-era white pine beams or wood from a nearby 100-year-old barn.